The scores here were really interesting. Of Bruce’s five records to date, you scored this the highest for longevity, lyrics and musicality, yet the lowest by some margin for musical collaborations. The five highest rated songs beat out anything on the previous release Hot House, and Fortunate Son is the highest ranked song since the orginal album, bar Harbor Lights’ title track. We even have a couple of non-ballads in your top five, where Great Divide and Resting Place score very well. The high score for longevity is reflected in today’s setlists, where almost all are played today. Curiously, we have no record of Listen to the Silence ever having being played live.The lower end of the scale saw Listen to the Silence and Pete and Manny push the total Spirit Trail score to just below Hot House, by 1%. The highest rated tracks fare very well; lyrics and musicality compare favourably with previous releases. CD Shakedown: …has inspired strong feelings, with some critics calling it the Album of the Year. 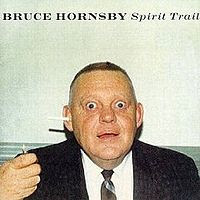 Nobody seems to like the silly cover (a 1966 photo of Hornsby’s late Uncle Charley), except Hornsby, who explains “It’s ironic to use an inane cover, because it’s a fairly serious record.” Fans of challenging pop, with a languorous streak, will enjoy Spirit Trail.